In the process of the mechanism of sand production line, sand washing equipment of the discharging mouth jam phenomenon is more common, in general, the reason is mainly caused by sand fairly granular in the pulp, the single quantificationally and sudden increase, lead to discharging mouth deposition materials. While, solving method of sand washing machine discharge port plug mainly can be divided into three aspects. 1,The discharge pipe of the sand washer is not unobstructed, resulting in the clogging of the cyclone;If the material is fed too fast, the air outlet of the equipment will be blocked.Improper matching with conveying equipment will result in the cyclone force weakened or no wind after plugging. After the fault is found, the air inlet should be cleared first to change the mismatched conveying equipment and adjust the feed quantity to ensure the normal operation of the machine, so as to ensure the finished product quality of the production line of machine sand. 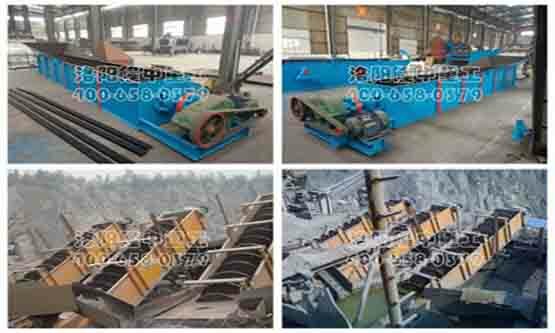 2, Once the screen plate of sand washing machine is broken and aged, the screen hole is closed and the water content of crushed materials is too high, which will make the equipment blocked. To solve these problems, it is necessary to replace the broken and seriously aged screen regularly to keep the equipment in good working condition. The power must be matched with the amount of sand output, and the screen should be checked regularly. In this way, the production efficiency can be improved, and the blockage of sand washing machine can be prevented, thus enhancing the practicability of the equipment. 3, In order to prevent the sand washing machine plug, in the sand washing machine feeding process, at any time to pay attention to the changes in the ammeter pointer, feed too much, then the ammeter pointer deflection Angle is large, if more than the rated current, indicating that the motor overload, overload for a long time, the motor is easy to burn out. This is because the sand washing machine feeding speed is too fast, the load increases, resulting in blockage. The above is the description of the phenomenon that the discharge port of the sand washing machine in the production line is blocked and the analysis of the solution. If you have any questions, please contact us.